Eggs are such a great compact source of protein to start off your morning. However, when you are doing a program like whole30, plain eggs in the morning can get boring quick! When you first tell people the parameters of whole30 they tend to think that you can't eat anything sweet but that just isn't the case! When you cut out all added sweeteners from your diet you start to notice and appreciate foods natural sweetness! That has definitely been the case for us with strawberries this season! Every single one I have eaten this week has been so juicy and bursting with sweetness! This recipe is great for serving to kids who aren't crazy about eggs! Claire adores eggs of all kinds but Kenley is much more picky about her egg consumption. Kenley gladly ate her portion and then asked for seconds! 1. Place eggs, coconut cream, zest from 1 clementine, the juice from 1 clementine, and pinch of salt in your blender. Process until mixture is well combined. 2. Add chopped strawberries to the blender and pulse until strawberries are just barely broken down a bit. 3. Add a bit of coconut oil to your pan, pour your omelet batter in, and cook as you would any other omelet*. 4. 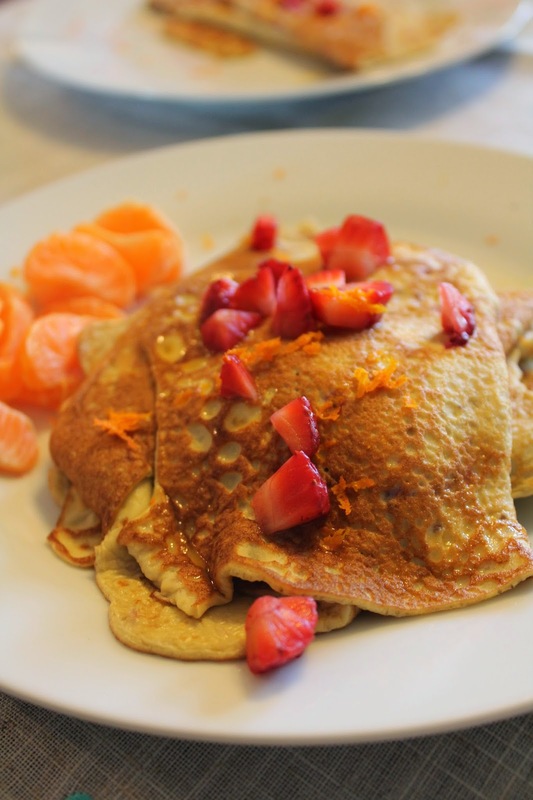 Plate your omelet and then top with additional chopped strawberries, then add the zest from the remaining clementine, finally squeeze the juice from the remaining clementine over your omelet. *My omelet making technique isn't the greatest so rather than ending up with scrambled eggs by making my omelets in a pan. I like to use my electric griddle. I pour a bit of batter on my griddle (like a pancake) and then let that cook until the top is starting to bubble a bit. Then I flip it in half and am left with mini omelets. This way works great so that I can easily divide this recipe between the girls and I!